Jan. 22, 2016, 8:37 p.m.
Learning more about the faiths of others can lead to respect and dignity, breaking down the walls that divide and pit people against one another. Often, those of various religions find they have much in common. 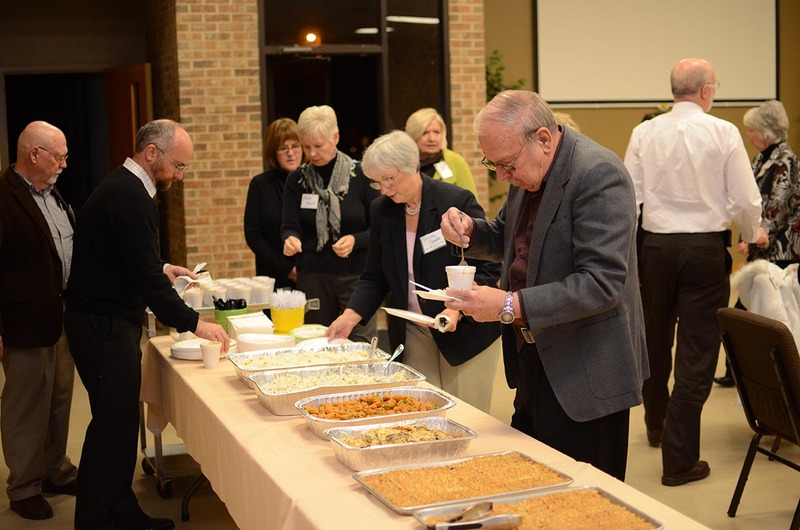 That was the goal of the ninth annual “Dinner of Abrahamic Traditions” co-hosted by the Atlas Foundation and the Interfaith Federation of Greater Baton Rouge. More than 50 area Methodists, Lutherans, Catholics, Unitarians, Presbyterians and Episcopalians joined Muslims and Jews at a local synagogue to celebrate what they have in common after a long day of Martin Luther King Jr. Day activities on Monday. “Dialogue is so critical that we sit down and get to know each other,” McCullough-Bade said. “Dr. King spent a lot of time finding this common ground. He was able to talk to Gandhi … and walk the streets with a Jewish rabbi with a white priest. It didn’t lessen who he was in his faith, yet he provided this vision for all of us — living out his faith. The dinner, five courses of vegetarian Turkish dishes, was good, but many of the attendees said the fellowship was even better. “The tradition of hospitality goes all the way back to Prophet Abraham, who was famous for hosting everybody. His door was always open to everybody, so we try to follow that tradition, to share a meal with people of different faiths and backgrounds,” said Emrah Aktepe, executive director of the Atlas Foundation, a local Turkish group dedicated to promoting dialogue and cooperation among people of different faiths and cultures. “The point is to bring clergy of the three Abrahamic faiths together, to extend our friendship and find out about our similarities while respecting our differences,” Aktepe said. The Atlas Foundation was started in 1999, he said, adding that in most counties there are similar interfaith groups, called the Hizmet Movement, based on the Sufi-inspired, Sunni Muslim philosophy of Turkish scholar Fethullah Gülen. The meatless dinner was kosher, Aktepe said, and attendees heaped their plates with pasta salad, feta cheese pastries, rice pilaf with chickpeas and spicy lentil balls, filled cups with lentil soup and finished the meal with baklava. Mark Glickman, Beth Shalom’s interim rabbi, opened with a Hebrew prayer, and John Armstrong, who attends St. Aloysius Catholic Church, was first in the self-serve line. While researching his first book, “Sacred Treasure: The Cairo Genizah,” Glickman discovered that the “genizah,” a depository of manuscripts found in an ancient synagogue, revealed how Medieval Egyptian Jews and Muslims, “believe it or not,” he said, got along despite their religious differences. “Jews spoke Arabic as their first language and were often close friends with their Muslim neighbors,” Glickman said, “and every once in a while, they got married. It was scandalous, but it happened. The Rev. Jane Riecke, senior pastor of University United Methodist Church, told how she was the only child of parents who loved education and history and often traveled. “As a white Christian, I had predominance in the culture and many, many benefits to that,” she said. Her passion for traveling and learning has taken her around the world, she said, and those experiences gave her a greater sense of inclusivity. But, Riecke confessed, she had never participated in a Martin Luther King Jr. march until that day. The Rev. Steve J. Crump, senior minister of the Unitarian Church of Baton Rouge and one of the Interfaith Federation’s earliest members, said the meeting was “a wonderful expression of the diversity of Baton Rouge and our region.